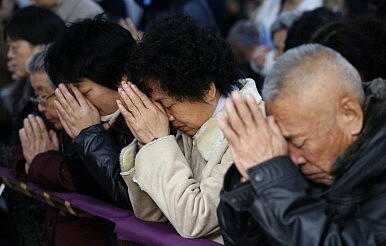 The week starting May 18 marked a new low for religious groups in China. That Sunday, authorities quietly removed or destroyed crosses at 50 churches in Zhejiang in what appeared to be a widening campaign against Christianity in this prosperous eastern province. No mention of the campaign appeared in Chinese media. Four days later, Islamic separatists plowed into the crowded main market in Urumqi, at the opposite end of the country in Xinjiang province, throwing explosives at innocent shoppers and killing 43 people including the five assailants themselves. The next day, Chinese authorities announced a one-year crackdown in restive Xinjiang using “extremely tough measures and extraordinary methods” following a spate of attacks including this second incident in the provincial capital in less than a month. Although unrelated, these incidents mark a new battle against religion in China: a silent offensive against Christianity in the eastern Han heartland and a much louder campaign against Islamic extremism by minority Uyghurs in the northwest. Is it a fight the Chinese Communist Party can win? Severe punishments have followed in Xinjiang thick and fast. On May 27, authorities held a mass trial of 55 people in Yining City stadium packed with a 7,000-strong crowd, with three of the defendants sentenced to death on charges including “violent terrorism.” A week earlier, 39 people were found guilty amid scenes reminiscent of the Cultural Revolution of four decades ago. Mass trials have not been seen in China since the 1990s. Alim Seytof, director of the Washington D.C.-based Uyghur Human Rights Project (UHRP), says that the new campaign in Xinjiang has seen armed police and special police forces deployed from elsewhere in China in the two biggest predominantly Uyghur cities of Kashgar and Hotan. Beijing is blaming minority Uyghur Islamic separatist groups – the most prominent of which is the East Turkestan Islamic Movement – for at least 10 major terrorist attacks that have left more than 145 people dead in less than a year, mostly in Xinjiang. Although the government formalized a new campaign only after the recent Urumqi attack, Seytof says authorities slowly ratcheted up a crackdown on Uyghurs in recent months with each new terrorist attack, often using measures that directly punish religious practices. On April 16, the website of the Aksu prefectural government published details on how residents in Shayar county could be rewarded up to 50,000 yuan ($8,000) for reporting on local residents exhibiting any one of 53 proscribed behaviors. These included separatist preaching, storing guns, or providing funding to overseas anti-government groups, as well as people holding tabliqs, or informal religious discussions led by a layperson, or growing a long beard. Shayar, which lies close to the border with Kyrgyzstan, is 83 percent Uyghur. Following the latest terrorist attack in Urumqi, China’s state press has hinted at the growing resentment that lies at the heart of China’s growing ethno-religious fighting. Generally, however, such discourse is sidelined inside the country. Liu Lei, Xinjiang military command commissar, said in a front page article carried in the state-run China Daily the day after the attack that religious extremists in Xinjiang were typically aged as young as 10 to 25 and jobless. The rest of the article focused on addressing symptoms of Uyghur discontent – cutting off terrorist funding including from “The West,” the possibility of a new Chinese terrorism law, and increased security checks in hospitals, schools and shopping malls. Seytof argues that Uyghur extremism is generated by years of worsening repression. Uyghurs are treated as second-class citizens on their own land, he says, and Beijing – in trying to assimilate the population in the name of stability – is forcibly attempting to erase this minority Muslim culture, including its religion. A vast region of deserts and bitterly cold winters that see temperatures drop to below minus 30 degrees Celsius, Xinjiang is a construct of the People’s Republic of China that has variously been wholly or partly controlled by previous Chinese dynasties, Russia and various Central Asian peoples. East Turkestan, the preferred moniker for the region used by separatists, was only in existence for one year, 1933, before it was taken back by Chinese Kuomintang troops. Strategically important, China’s largest province is a key part of an economic jigsaw connecting with Central Asia via oil and gas pipelines crisscrossing the expansive Tarim Basin that dominates this remote region. “The Uyghur resentment toward Chinese rule comes from their failure to master and change their political destiny, and the sense of being overwhelmed by millions of Chinese settlers,” said Seytof. While Chinese authorities have typically played to the majority in announcing measures against this Muslim minority, when it comes to growing crackdowns against Christianity – quite widely practiced by Han Chinese – Communist authorities have generally proven less forthcoming. On April 28, authorities sent in bulldozers to demolish Sanjiang Church, a $5.5 million structure in Wenzhou, Zhejiang province the local government says overstepped documented planning permission but which the congregation says these same officials orally permitted. The little coverage the demolition has received in Chinese media has portrayed authorities treating the church even-handedly as a violator of building rules in booming Wenzhou, a port city of nine million people labeled “Jerusalem of the East” because of its large Christian community. “All the churches that received demolition orders are illegal,” an official of Wenzhou’s Three-Self Patriotic Movement, China’s government-sponsored Protestant church, told the state-run Global Times. However, a document leaked and shared among Chinese Christian communities paints a picture of a systematic anti-Christian campaign in Zhejiang province this year. The document, which cannot be independently verified, details how authorities planned to identify targets including churches, unsanctioned house churches, and crosses from the start of the year until mid-February with the aim of tearing them down later this year under the pretext of building violations. “The priority is to remove crosses at religious activity sites on both sides of expressways, national highways and provincial highways,” the document says. Aside from the 50 crosses torn down and destroyed in Zhejiang on May 18, a further 60 churches have been forced to remove crosses or have been destroyed in Zhejiang province, according to China Aid, a Texas-based Christian rights group with a network of people inside China. House churches, which are considered illegal by the authorities, have come under increasing harassment, said China Aid, and a Christian park in Wenzhou was torn down in April. The heightened crackdown on Christianity in Zhejiang province appears to originate with the visit of provincial party secretary Xia Balong. Reportedly unhappy with the prominence of the Sanjiang spire, which rose more than 50 meters, a month later the congregation was told to remove the cross and the battle to save the church began. It remains unclear whether the government’s fight against Christianity in Zhejiang is just policy at the provincial level, or whether as a densely populated Christian region it represents a pilot for social engineering-obsessed Beijing for a program that could be extended countrywide. Many Christians in China say they fear the worst but are trying to remain optimistic. However, self-exiled Chinese Pastor Bob Fu, president of China Aid, says there are already signs an increasingly harsh anti-Christian campaign is spreading. “Even other provinces such as Guizhou, Anhui and Guangdong, house churches have started receiving notices to either join the government-sanctioned church or face destruction,” he observes. At Shouwang Church in Beijing, one of the most popular unsanctioned churches in China, police have started to detain members of the congregation for upwards of seven days, say church sources, whereas previously they were held for a few hours or turned away. Also last month, the government issued a statement banning the conversion of children at faith-based orphanages. Signs suggest the government has become increasingly irritated by Christianity, which has historically been viewed in China as a Western-originating threat to power in Beijing. When Fenggang Yang, director of the center of Religion and Chinese Society at Purdue University, Indiana State, was quoted on April 18 claiming China would become the most populous Christian country in the World by 2030 with 247 million faithful, the party hit back six days later rubbishing the claim. “It is completely meaningless to predict how many people might believe in Christianity in China in the future,” he added in the Global Times. Although urban migration from villages including those dominated by Christians has swelled congregation sizes at churches and cathedrals across the country – many of which have been forced to add extra services and put towers of plastic chairs outside to accommodate churchgoers, few in China doubt Christian ranks are swelling. Sheer numbers appear to be working against the party, a network of people over which it struggles to exert control. While the government says there about 25 million Christians, most independent estimates say the real number is at least 60 million, more than the total number of churchgoers in Europe. The Chinese Communist Party appears concerned. Last month, Beijing issued a policy-advising “Blue Book” report stating that religion posed a serious threat to national security along with Western democracy and cultural hegemony as well as the spread of information on the internet. “Foreign religious infiltration powers have penetrated all areas of Chinese society,” read the document. Chinese media reported that this policy paper could inform the new National Security Council created in November, which held its first meeting in April. At the very summit of government, there have been no explicit signs of a crackdown on Islam and Christianity in recent months, but few China watchers are in doubt that an apparently threatened Communist Party is clamping down on these religions. “Recent developments indicate increased measures to control Islam and Christianity,” Purdue University’s Yang tells The Diplomat.